As part of my research into the history of the Enfield case I read the book written by one of the lead investigators of the case cover to cover. Guy Lyon Playfair's 1980 book 'This House Is Haunted' is a summary of the haunting from start to finish. I'm not the first person to say that the book is a must-read for anyone interested in the paranormal and it really is. To my knowledge there's no other book which contains the same detailed account of a haunting. As well as Guy's book, I also re-read the chapter of Gerald Brittle's book 'The Demonologist: The Extraordinary Career Of Ed And Lorraine Warren' which is concerned with the Enfield case. However, apart from confirming that Ed and Lorraine visited the house and thought the haunting was the work of a demon, it added very little to the story. I also watched hours of video of old television clips, and interviews with the family and witnesses of events in the house. The interviews date back to the month of the first outbreak, through to more recent interviews with those affected, some as recent as 2016. Janet and Margaret, the sisters who were at the centre of the case maintain their story to this day that their house on Green Street really was haunted. As a skeptic, Guy's book was an interesting read. There are several direct mentions of the fact that neither the author himself or the family made any money out of the case or the press attention surrounding it, perhaps this is just mentioned as it's a common criticism but it almost reads like he's protesting too much. Overall the book was a good read but it did come across as being written in quite a defensive tone which took away some of the enjoyment of the read. The author uses phrases like "almost impossible" several times, he says things along the lines of "it would have been almost impossible for the girls to open the window", "I tried and I could barely move it", and "it would have been really difficult for the girls to fake something like that". But "almost impossible" isn't impossible, "barley moveable" means it can be moved, and "really difficult" doesn't mean it can't be done. In one chapter of the book Guy describes an incident where the words "I am Fred" were found written on the back of the bathroom door, it was made from strips of insulating tape that belonged to one of the paranormal researchers. Guy and his fellow investigator, Maurice Grosse, conclude that this couldn't have been faked by the girls as the writing was made up of twenty individual pieces of tape and would have taken them too long fake. In writing my article on Enfield I wanted to recreate the famous photo (my version is above), partly to avoid image copyright issues and partly because I wanted my piece on the haunting to have some slightly different images as a point of difference to other articles and blog posts on the topic. I can say that it didn't take me long at all to cut up and stick the words on the back of my door. I could have certainly done it during a normal bathroom break without raising suspicion. What's more I was copying the look of the original text which means it may have actually even taken me a little longer than it could have. Nothing documented in the book sounds impossible to fake to me. From the accounts levitation to the demons voice being spoken through the girls, it could all be achieved by the girls themselves. The fact that in most cases the poltergeist told the researchers that it didn't want them in the room and wouldn't perform until the door was closed or their back was turned is very suspicious. Of all the events that occurred in the house, very few were actually seen by an observer, most took place behind closed doors or in another room. The exception to this being a chair that the first police officer to visit the house saw move across the floor, and an event witnessed by two members of the public who saw Janet levitating through the upstairs bedroom window. In the case of the levitation, this could have easily been Janet bouncing on her bed. The lollypop lady who witnessed it said she saw Janet go up and down about six times, her arms and legs were going all over the place. Personally I'm sure that's what it would look like if someone were bouncing on their bed and pushing themselves up off of their back. As for the chair that the WPC saw moving, that I can't explain. She's a good credible witness and her testimony doesn't suggest any obvious fakery, but what's odd is that no one else in the house that night saw the chair move. I wanted to put something a little different together for the 40th anniversary, so I decided to compile a timeline of events in the house as I haven't seen this anywhere else. I trolled through 'This House Is Haunted', cross referenced the accounts with dates and times mentioned in interviews, summaries of papers released by the Society for Psychical Research, and Ed and Lorraine version of events. I've been fascinated by the Enfield poltergeist case for as long as I can remember, especially because it inspired not only 'Ghostwatch', one of my favourite TV moments of all time, but also the 80s classic 'Ghostbusters' which was a massive part of my childhood. Few know that Dan Aykroyd picked up Gozer, the name of the Ghostbusters' nemesis, from the Enfield case. The story has also influenced TV shows and had a Hollywood movie made about it. I called in the help of a friend and regular contributor to my website to help retell the story of Enfield and do it justice. Gareth looked at the famous poltergeist case from a slightly different angle to me, analysing the context of the haunting and attitudes towards the paranormal in 1977. He also asked whether any films, book or television shows of the time could have influenced the case. This 40th anniversary project has been one of the biggest pieces of research I've embarked on. I've learnt a hell of a lot about the paranormal events which took place in late-70s London. In fact there were six facts I stumbled across which were completely new to me and don't seem to be too widely publicised. If you've been following my journey through the Enfield case files, then you too may feel like you've learnt a fair amount about the case, so to finish off this week of Enfield remembrance, I'm giving you the chance to test your knowledge with a quiz on the history of the hauntings in Enfield. 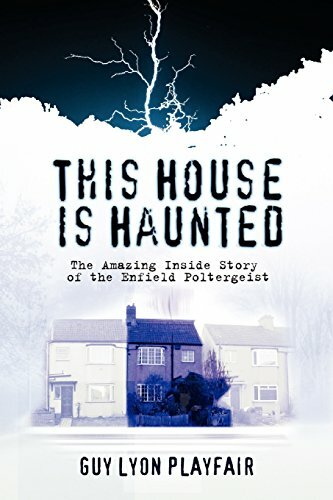 And if you still want more Enfield, then I highly recommend the ParaPod episode where Barry Dodds who is a strong believer in the paranormal tries to convince his skeptical friend and co-host Ian Boldsworth (or Ray Peacock as he was known back in 2015 when the podcast was recorded) that the case was a real example of paranormal activity.